Olentangy’s Maddie Garner slices between Orange defenders Kailee O’Brien (5) and Taylor Houston during the first half of Thursday’s showdown in Lewis Center. The Olentangy girls lacrosse team did what it has done the entire season. It found the back of the net. 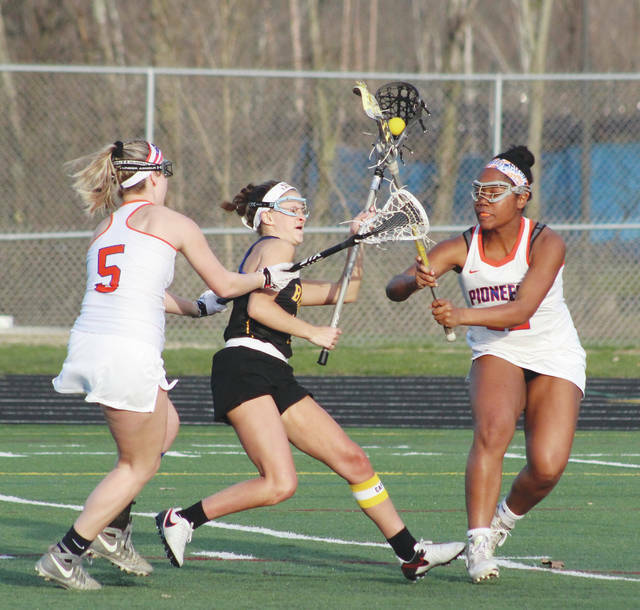 Maddie Garner had seven goals and helped out on four others to lead visiting Olentangy passed rival Olentangy Orange 21-10 Thursday night in Lewis Center. Garner’s free-position goal with 21:12 left in the opening half gave Olentangy a 2-1 lead, starting a 7-goal rally over the next 8 minutes, 5 seconds. The Braves never trailed again. Garner said the free-position shot was something Olentangy had been working on lately, and it showed as four of the team’s 10 first half goals came in that form. Still, Orange didn’t go quietly, rallying for five of the final seven goals of the half to close within 10-5 at the break. Melanie Neuman and Kailee O’Brien scored back-to-back goals early in the second half to get the Pioneers as close as 11-7. But, Olentangy scored 10 of the final 13 goals to put it out of reach – led by Garner and Kenzie Sklar with three apiece. Sklar finished with five goals for the game and Elise Harder scored five and dished out four assists for Olentangy (5-0, 3-0), which has scored 20 goals or more in each of its last four games. O’Brien finished with three goals and an assist, Hannah Brown scored twice and Neuman chipped in a helper to go with her goal to lead Orange (4-2, 1-2), which has lost its last two by a combined 37-10 margin after outscoring opponents 53-8 in its first four games. Next up for Olentangy is a trip to Mason Saturday morning at 11 a.m.
Also: Hilliard Darby 14, Delaware Hayes 11. Blake Eiland and Alex Schumacher scored two goals apiece to lead Delaware Hayes to a 9-3 win over host Darby Thursday in Hilliard. Andrew Lyon, Casey Eiland, Sam Lagando, Ryan Smudz and Connor Prenger also found the back of the net in the win. Nathan Heiser poured in a game-best seven goals and Andy Nero and Trent Slavik added two apiece to lead Buckeye Valley to a convincing win over visiting Columbus Academy Thursday in Delaware. Reid Lajeunesse added a team-best two assists while Nick Gerold finished with five saves in the Baron goal. Also: Olentangy 13, Olentangy Orange 4; Olentangy Liberty 17, Westerville South 0.